"So chaps, I'm back from camping in Ireland. Whilst I was there I got very dirty and came back stinking of campfire, but I also got fed some yummy food. I made the bloke Sarah calls 'the other half' take a few photos, and she said she'd put them up here, but only if I had a little run in the washing machine first. Well, to be fair I was scaring off the rest of the family menagerie with my pongyness, so I reluctantly agreed..."
Cooking up a storm... in a storm. I'm not sure whether to call this breakfast, brunch, or lunch, as we ate it at about 11.30am but had already had a slice of toast at 8am, and ate again at around 4pm. Ah well, it was a definite camping larder meal, using the stuff I'd brought with me or acquired throughout our trip, and eggs that the chickens of our next campsite, the brilliant Pure Camping in Querrin, Co Clare, provided in the morning. It's fairly carb-heavy and bathed in oil, but that's what you need at the beginning of October, outdoors, in Ireland! 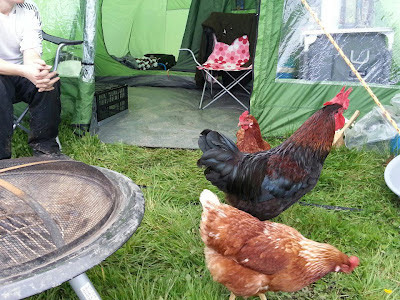 Let's go and lay eggs for George's breakfast, and then make lots of mess in Sarah's tent. Egg still in pan when other half took photo! Fry some chorizo and chopped shallots in olive oil, before adding a chopped fresh chili, a chopped clove of garlic and 5 or 6 chopped chestnut mushrooms. Wait until the shallots and garlic are coloured by the chorizo paprika, add a tin of chickpeas with a mug of vegetable stock, and season. Leave to bubble down until most of the moisture has gone. In the meantime, shallow fry last night's already-cooked potatoes, chopped up, in whatever oil you have (mine was olive oil but it would be better in vegetable oil or nut oil, especially when you haven't got state-of-the-art washing up equipment to get the stuck potato off the pan), then fry an egg at the last minute and serve on top of the salsa and potatoes so that the yolk runs out. Yummy. Get the other half to wash up in the state-of-the-art camping kitchen sink. Don't laugh, it doesn't half help your back! And well done on ditching the veggie life. Terribly boring when one can't have a bacon sarnie on a Saturday morning.